Sure, chalk this one up to laziness, but shouldn’t it be OK to throw out the bulk mail addressed to the previous tenant? Is it absolutely imperative that the catalog of overpriced wine and cheese baskets and reach its final destination? 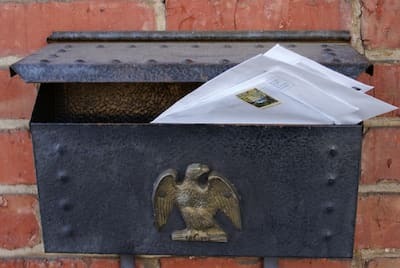 As annoying as it is to receive a handful of mail addressed to the person who lived there before you, interfering with the delivery of mail from the United States Post Office is a federal offense – punishable by a fine or even jail time. The U.S. Code (18 U.S. Code 1701, 1702 & 1703) prohibits the obstruction, delay or destruction of mail. Possible jail time for an offense can vary from six months to five years, and the fine imposed can be up to $5,000. It’s not worth trying to fight the system on this one. Simply write “return to sender – resident no longer at this address” on any piece of mail that’s address to someone else. First off, you won’t be breaking the law. Second, the Post Office will likely be able to update the information and eliminate the problem altogether. 0 Responses to "9. Throwing away mail not addressed to you"